Plumtree & Searle, Motor Engineers. Homepage. This page: Motor Engineers in Sheffield receive a Morris in part-ex for a new 100E Prefect. 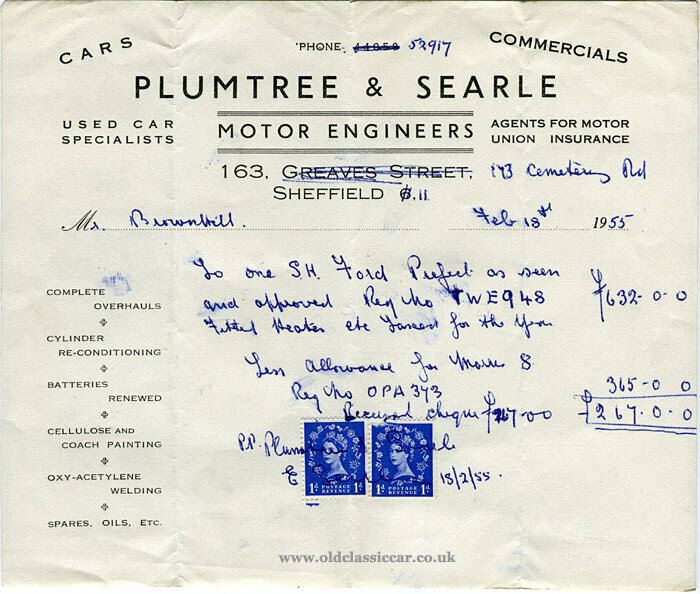 Hand-made alterations to this old invoice show that Plumtree & Searle (Motor Engineers), had been located at 163 Greaves Street in Sheffield, but by February 1955 had re-located to 173 Cemetery Road, again in Sheffield. This invoice came about because a Mr Brownhill had decided to part-exchange an old "Morris 8", registration OPA 373, for a near-new Ford Prefect (with heater), that was registered TWE 948. The Ford was priced at 632 GBP, against which 365 GBP was given for the incoming Morris. Curiously, the Morris' registration series (OPA - Surrey) came into being in January 1950, yet the Morris 8 had disappeared from showrooms to be replaced by the Minor, in 1948. Could the car in fact have been a Morris Minor MM, or was it indeed a late Series E Morris 8, that perhaps hadn't been registered until 1950? Fortunately, another document in with the invoice already mentioned confirms my initial theory, that OPA was in fact a Minor. An insurance document that belonged to Mr Brownhill, issued by the Royal Insurance Company Limited in 1953, proves that OPA 373 was indeed a 918cc Minor MM built in 1950. I wonder how the outgoing Morris compared to the new Ford? The 100E Prefect sported a January 1955 registration (TWE) local to the area. This invoice was kindly sent over by a visitor to the site, along with an original sales brochure for the mid-1950s four-door 100E Prefect. Presumably it was this brochure, acquired from nearby Ford agency T.C. Harrison Limited, of 53-61 London Road in Sheffield, that persuaded Mr Brownhill to replace his Morris with a shiny new Prefect. 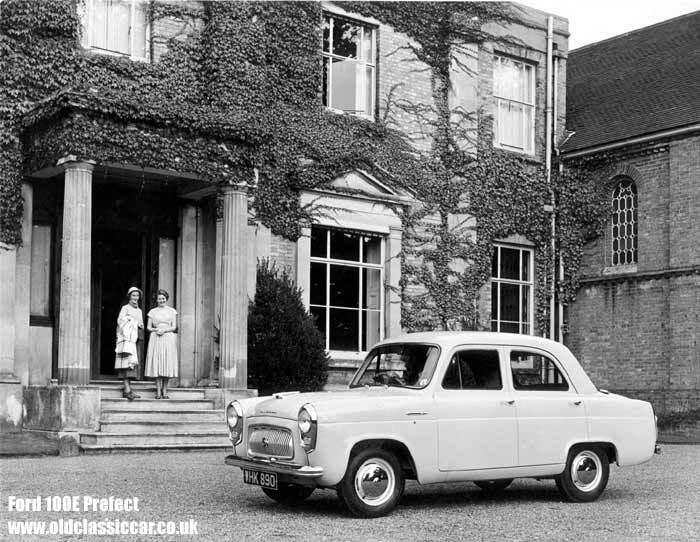 The Prefect was a more upmarket version of the 100E Anglia and Popular. 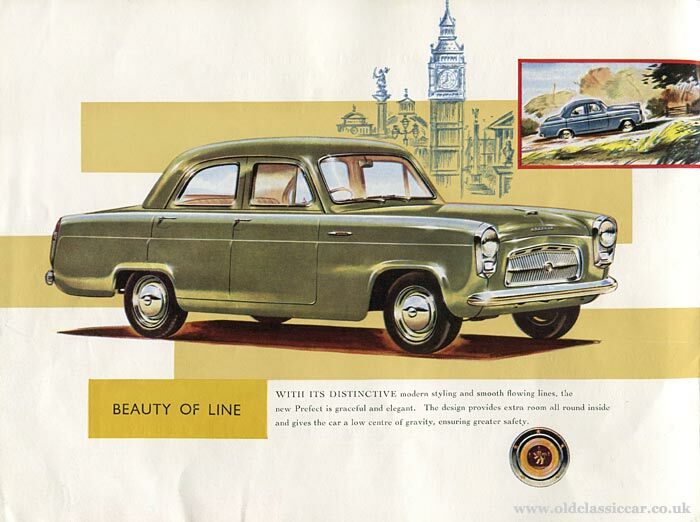 Unlike the more lowly models, the Prefect came with four doors (rather than two) as standard, plus extra brightwork including a more eye-catching grille and headlamps surrounds, all chrome-plated. Period photographs of various 100Es can be found on this page of the site, in the old photos section. One of them, an original press photo, is shown below. Despite employing reasonably modern styling for the era, beneath the bonnet remained a by-then outmoded sidevalve engine of 1172cc, similar - but not identical to - the 10hp (RAC) engine also found in the upright 103E Popular, which could trace its roots back to the Model Y (in 8hp form) of the early 1930s. By this time, arch rival BMC had switched to OHV engines throughout its range. Despite this, the 100E sold well, and would be joined at the end of the 1950s by the 107E Prefect, which benefited hugely from the fitment of the 105E Anglia's OHV engine beneath its bonnet. 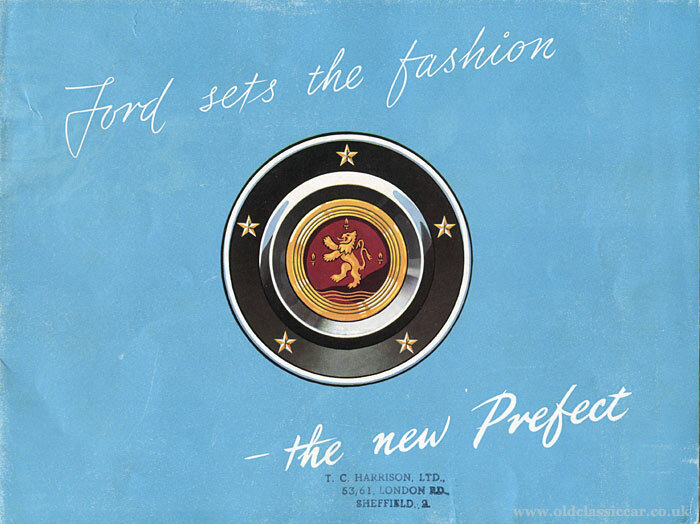 A selection of scans taken from the Prefect's sales brochure, issued by the garage in Sheffield, are shown below. And what of the supplying dealer in Sheffield? There don't seem to be many details regarding the Plumtree and Searle business online. As for Greaves Street, it is now a small residential street with houses that look to date from perhaps the 1970s on it. Much of Cemetery Road has also been re-developed since the 1950s, so I suspect little if anything related to this motor engineering business remains today. Neither of the aforementioned cars' registrations appears on DVLA either, so likely as not the Ford and Morris have long since been scrapped.